The Shay Cormac Figure brings to life one of the most popular Templars in the Assassin's Creed Franchise. Wearing his original Templar Robes, given to him as a gift by the Finnegans, the figure skillfully recreates the complex patterns and designs found on the coat. 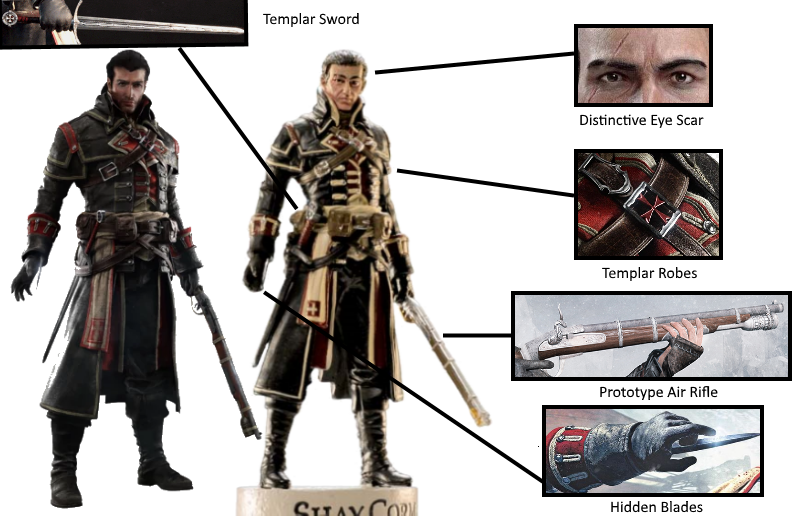 Looking carefully at the Shay Figure, we can see a red Templar Cross painted on to his double shoulder belts, providing him with a place to store his Prototype Air Rifle. The Shay Figure also has a number of pouches attached to belts, providing Shay with storage space for items such as Smoke Bombs. He has five brown pouches attached to his coat. My favourite thing about the Shay Figure is the tiny Templar Cross that can be found on the handle of his Sword. It also has the brown handle, making it look identical to the one we see in AC Rogue (See image below). ​He also carries two pistols in holsters that are attached to the back of the coat, giving him three deadly guns on his person at all time. The Prototype Air Rifle has been recreated in excellent fashion, and looks to be to scale when compared to Shay's body size. It is a weapon that requires two hands to function, and attaches to the shoulder belts strapped to Shay's back. Shay's Hidden Blade is engaged on his right arm, (as seen on the image below), using the equipment and skills of the Brotherhood against them. Looking at Shay's face, we can see the distinctive eye scar that slits open his eyebrow, the sign of an attack that met it's mark. His hair is kept neatly in a ponytail, tied back with a red hair tie, as seen in Rogue. I was particularly impressed with the attention to detail that had been made when recreating Shay's Coat, as it features all of the buckles, belts and straps that we see in Rogue. Issue #7 begins with an overview on why Shay left the Assassin Brotherhood, and joined the Templars in a decision that would change his life forever. He took no pleasure in killing his former comrades, and considered many of them to be honourable (though misguided) people. The earthquake in Lisbon caused Shay to question the actions of the Brotherhood, and his own future with the Assassins. ​The Character Profile tells us that Shay spent four years as an Assassin, but chose to defect to the Templar Order. His mother died during childbirth, and his father was often absent, leaving him to be raised by his aunt. When he was old enough, Shay joined his Father in the Merchant Marine, training in marksmanship and the use of a sword. When his Father and many of the crew members died in a storm, he returned to New York, where his old friend Liam O'Brien introduced him to the Assassins. The mentor of the Assassins, Achilles Davenport recognised Shay's potential, and inducted him into the Brotherhood. Shay questioned the Creed, and the differences between Assassins and Templars, causing him to become suspicious of the Mentor. His dissatisfaction was voiced as he noticed an increase of control over Assassin movements by the Mentor, causing him to doubt if they truly were "free". Shay was sent to Lisbon, Portual to access a Precursor Temple the Assassins believed contained a Piece of Eden. Upon accessing the Temple, Shay removed the artefact, triggering an earthquake that almost completely destroyed the city. Tens of thousands died, and Shay felt that the Assassins were responsible for the all the innocents who lost their lives that day. Upon returning home to the Brotherhood, Shay confronted his Mentor and other Assassins at the Homestead, and chose to steal the Voynich Manuscript that had helped them find the Temple. After sneaking into the Homestead and stealing the Manuscript, Shay was confronted by Achilles, who attempted to prevent him from escaping. Cornered and alone in the grounds of the Homestead, Shay jumped off the cliff, and took a bullet to the shoulder, as he no longer had anything to live for. The Assassins believed that the Manuscript was lost at sea, and Shay was dead, a severe blow to their plans. Surviving the fall thanks to Colonel George Monroe, he was placed with the Finnegan Family in New York, who nursed him back to full health. 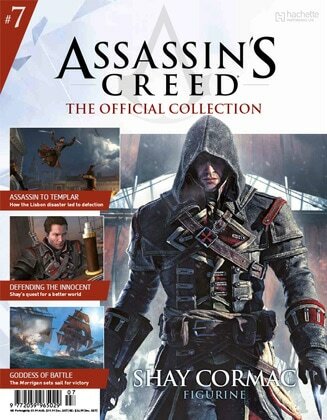 This section lists in detail the doubt that the Assassins placed within Shay's mind from the beginning, causing him to question the Creed. To Shay, the Templar philosophy emphasised bringing about a more secure future, something that the Templars aimed to bring about for all. Friends and Enemies looks at the many allies that Shay finds himself associated with. Colonel George Monro, Christopher Gist, Haytham Kenway and Benjamin Franklin are all characters who feature in Assassin's Creed: Rogue, and help Shay in numerous different ways. Franklin is the only person in this section who is not a Templar, but helps Shay because he feels he is a good person who deserves it. The Enemies Section lists Shay's former comrades, the Colonial Brotherhood of Assassins: Achilles Davenport, Liam O'Brien, Hope Jensen, Kesegowaase, Chevalier and Adewale, all of who (apart from Achilles) are assassinated by Shay. Each character is explained in detail, and their role in securing the Assassin's hold over North America. ​Fights and Feuds looks at the many events that shape Shay into the Assassin Hunter he becomes. The Lisbon Disaster is the catalyst that causes Shay to defect, but other events such as The Arctic Expedition, Killing Adewale and The Recovery of the Precursor Box in Versailles all reaffirmed the Templar Order's goals and aims to Shay, who served the Order well. The next section is titled Environments, and looks at the many settings and events that can be found in Assassin's Creed: Rogue: The Seven Years War, The Hudson River Valley, New York, The North Atlantic and Lisbon Temple are all environments that feel and play differently in the game. All are environments that the Assassins work to secure, but find themselves undone by Shay, who chooses to stand against them. The last section looks at Shay's Ship, The Morrigan, a vessel which serves both the Assassins and Templars. Under the Templars, the Ship is upgraded with many experimental weapons that cause extreme damage to enemies. Also equipped with resources such as an Ice Ram, Burning Oil and a Mortar, the Morrigan becomes as deadly as a ship twice it's size. With Shay at the helm as Captain, the ship gains quite the reputation amongst enemy forces. The Prototype Air Rifle can also be found in this section, something that becomes one of Shay's signature weapons. I found this issue to be interesting, as it looks at the differences between Assassin and Templar philosophy, and the consequences that follow when betraying the brotherhood.